Lee Picton has urged South Shields to keep their focus as they aim for six of the best at Mariners Park tomorrow. Shields have won their last five games in all competitions to build some momentum. It’s back to the league for the Mariners tomorrow as they host 18th-placed Mickleover Sports. They will be looking to improve their current position of sixth in the Evo-Stik Premier standings, with Shields 10 points behind leaders Scarborough Athletic but with three games in hand. Joint manager Picton insists that they can’t look too far ahead as they aim to close that gap – and says focusing on the here and now is vital for the Mariners. He said: “It’s a massive cliche, but we’re taking it one game at a time. “We’ve talked about trying to stop looking too far into the future. “We’ve had a few ups and downs so far this season and we’ve had little targets here and there, but we got to the stage where we told the lads to just concentrate on winning the next game of football. “It has served us well to this point. 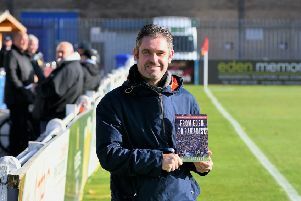 Shields are hoping for a bumper crowd at Mariners Park as they look to continue their fine form, and Picton hopes the community turns out in force to get behind the team. 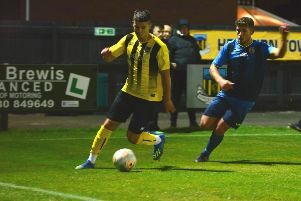 Picton added: “The club has made considerable efforts to earmark this game to put some promotions out and try to get a few more people through the gate. “Hopefully the community will respond to that. “There are lots of people out there who won’t have tasted the experience of coming to Mariners Park. “If we can get a few people along who want to do that for the first time and hopefully put up a good show both on and off the pitch as a club, we’ve got something really good to look forward to. “If we can get three points, we’ll be starting to build up a run and a bit of momentum. Shields remain without the injured Barrie Smith and Anthony Callaghan, but Gavin Cogdon made his return from a hamstring injury in last week’s game against Hyde United and will be in contention again. Picton is relishing the competition for places, and having the pacy forward to supplement an attack containing the likes of Carl Finnigan, Josh Gillies, David Foley and Ben Harmison. He said: “It’s certainly better than the situation we had a few weeks ago, when we had nobody to choose from up front. “You want to have tough decisions to make and it’s great to have Gavin back.